The latest issue of Rolling Stone magazines hit newsstands this week and features a familiar, though unexpected, face on the front cover: Republican presidential candidate Donald Trump. In a story titled, "Trump Seriously," reporter Paul Solotaroff delivered a close-up of what it's like to follow Trump on the campaign trail. 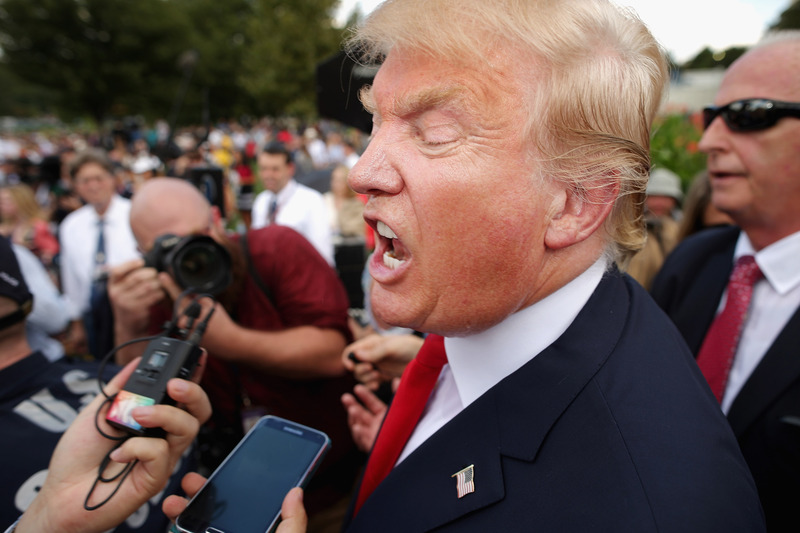 And what is it like to follow Donald Trump on his run for president? As you might imagine, Donald Trump's craziest quotes in his Rolling Stone interview run along the same lines as many of the other things Trump has said so far. Except this time, Solotaroff offers an astute analysis of exactly why so much of Trump's brand of crazy is landing with the American public. When the Rolling Stone story launched on Wednesday, the immediate coverage was about Trump's insult of fellow Republican candidate Carly Fiorina. In a particularly ugly and unscripted moment of his interview with Solotaroff, Trump reacted to a video clip of Fiorina by declaring that no one would want to vote for "that face." Look at that face! Would anyone vote for that? Can you imagine that, the face of our next president?! [...] I mean, she's a woman, and I'm not s'posedta say bad things, but really, folks, come on. Are we serious? To her credit, Fiorina kept it classy in her public response to Trump; in her interview with Megyn Kelly for Fox News, Fiorina said that Trump's attention might be turning to her because of her recent climb in the polls. I'm almost too exhausted to point out Trump's continued habit of reducing women to their physical features. But yeah, that. And for the record, lots of people can imagine voting for Fiorina; the former Hewlett-Packard executive's face — and her political platform — have inched up in the polls in recent weeks. But, believe it or not, the Fiorina quote wasn't the craziest thing that Donald Trump had to say in the Rolling Stone piece. Here are five weird things Trump said in his Rolling Stone interview that just go to show that Trump might just be playing a completely different game than the rest of the Republican candidates. Who Has The Better Jet: Trump Or POTUS? It's bigger than Air Force One, which is a step down from this in every way. Rolls-Royce engines; seats 43. Didja know it was featured on the Discovery Channel as the world's most luxurious jetliner? It isn't crazy for Trump to say that his plane is luxurious; it most certainly is. But to suggest that his jet is better outfitted than the flying War Room, uber-secure Air Force One? That might be a little nuts. Plus, since Air Force One is paid for by America's taxpayers, Trump is scoffing at what the "step down" he'd have to take to hold the office he's actually campaigning for. That can't be a good idea. Hey, you believe this goddamn ISIS? Chopping people's heads off, putting people in cages and drowning 'em. We gotta waterboard 'em, don't you agree? Someone might want to remind the Republican candidate that waterboarding terror suspects is one of the extreme interrogation practices that irrevocably tarnished George W. Bush's presidential legacy. In fact, Bush was still defending the decision-making process that led him to approve waterboarding terror suspects years after his presidency ended. When the head of Ford calls me up and he says, 'Mr. President, we really want to build this plant in Mexico,' I'll say, 'Congratulations... we're gonna charge you a 35 percent tax on every car and truck and part that comes in!' 'But you can't dooo that, Mr. President!' Trust me, I can do it — and what happens is, they probably fold by 5 p.m. This quote comes up during a passage in the Rolling Stone piece where reporter Paul Solotaroff points out the heart of Trump's campaign. The multi-billionaire has figured out a campaign message that speaks to what underemployed white middle-class voters believe are the source of their woes: immigration, free trade, and the old guard of Republicans who aren't doing anything about it. But here's the crazy part: what he's saying isn't actually possible. The President doesn't have the power to impose new taxes; that would take an act of Congress. We will make great trade deals. We will make Social Security without cuts. ... You'll have phenomenal plans — you'll have them for much less money. The insurance companies will not be happy, but, see, they don't give me money. They give to Jeb, and they give to Hillary. ... I don't want their money! It's statements like this that have Democrats (and other Republicans, frankly) wondering why Donald Trump is so popular. But pointing out the impossibility of grand plans like these misses Trump's strategy, according to Solotaroff. Crazy statements like this are landing with Trump supporters because they call out a Republican Party run by people made rich by the "deals" that his voters blame for their dwindling wealth and position. Those of us asking "but how?" and calling for policy details are missing the point entirely. I'm prepared to underwrite this! I make $400 to $600 million a year. Trump's position from the launching his presidential bid has been that, unlike other candidates who are beholden to special interest donors, he can afford to finance his own campaign. But that ignores an important third option: a campaign financed with donations from the individuals that believe in his platform. Rolling Stone reported that at its last filing, the Trump presidential campaign had raked in a mere $100,000 in campaign donations. Yeah, Trump can certainly afford to foot the bill for his campaign himself, but having to do so only proves that his run is lacking the one thing essential to a legitimate presidency: a mandate from the American people.